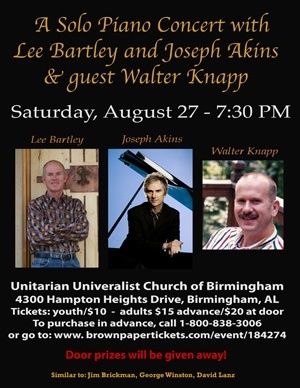 Solo Piano Concert with Joseph Akins and special guest Walter Knapp. The concert will be at the Unitarian Universalist Church of Birmingham, 4300 Hampton Heights Drive at 7:30pm on August 27th. The music will include classical, duets, classical art songs, and new age from three remarkable artists. Please join us.